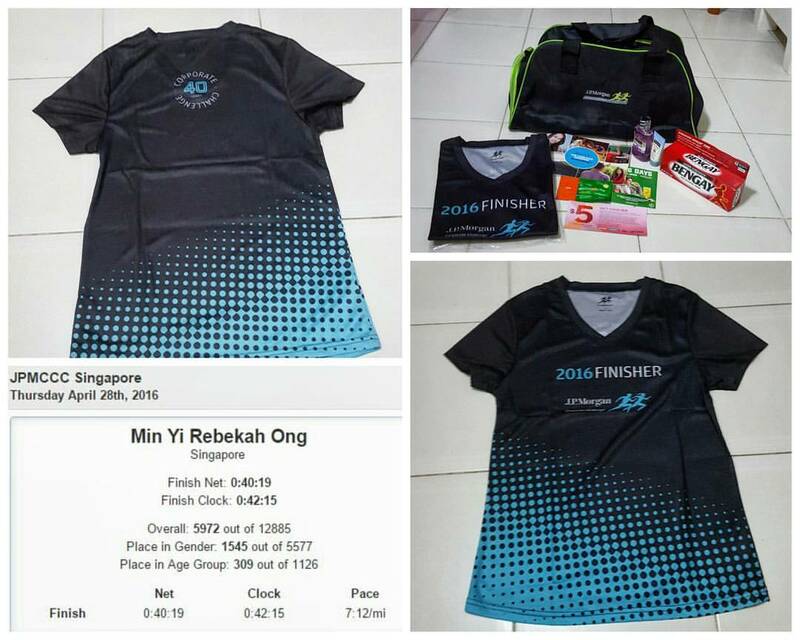 Race Review: J.P. Morgan Corporate Challenge 2016 [5.6 KM] (by Rebekah Ong) | JustRunLah! The J.P. Morgan Corporate Challenge (JPMCC) is one of the races that I look forward to signing up for every year with my company. 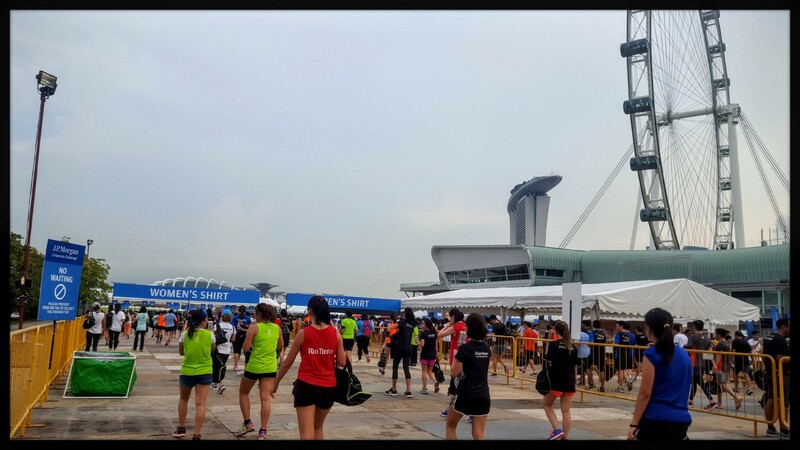 It is 5.6 km race that has it START point at the Esplanade Bridge and ends at the F1 Pit Building at Marina Bay. Every year the slots for this race always fill up really quickly as soon as the registration email goes out. 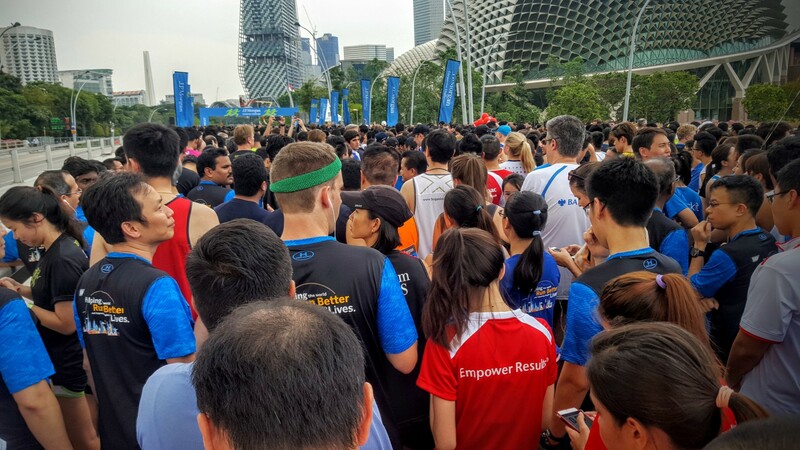 This is the 13th edition of the the JPMCC Singapore. It was launched to encourage a culture of work-life balance in a fast paced working environment. 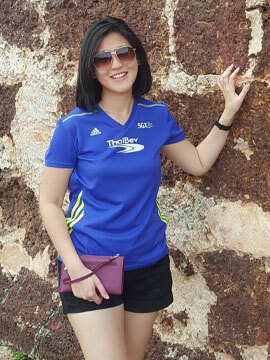 Managed to clear whatever I was working on by 16:45hrs to go and change into our company event tee and running gear. 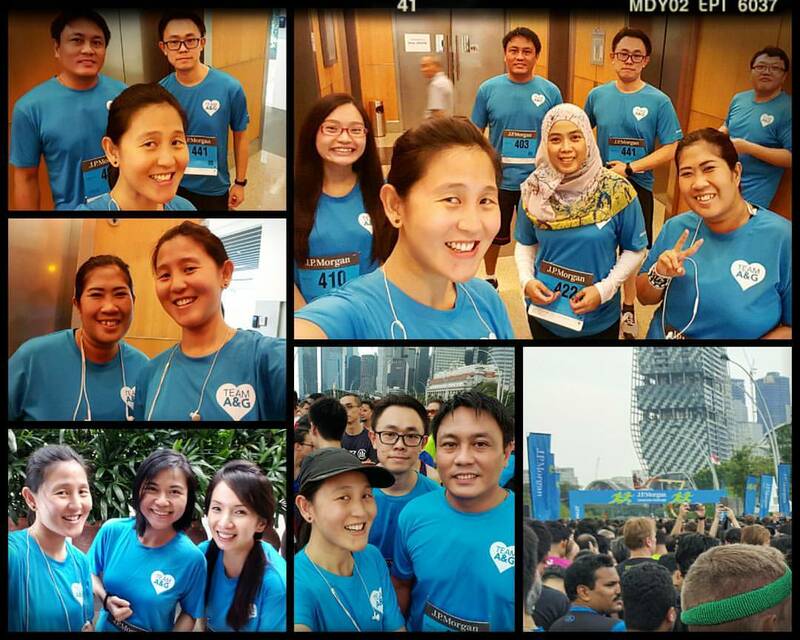 There were a handful of us from the Support Department that were taking part in the event and all of us were super psyched for the event! As normal, we always take some wefies before we headed for the race site. Walking to the START point, we noticed the sky was getting dark but it didn’t seem threatening for it to start pouring. There were lots of participants already at the holding pan. One of the things that I noticed was that the security were trying their best to filter the walkers and runners into the right line but not all of them knew which one was the correct one. Luckily my colleagues and I managed to get into the right lane and managed to head all the way to the front. Though we were a few meters away from the START line, it was nice to know that we would be flagged off in the first wave. Just 15 minutes before the actual flag-off timing, it started drizzling. There were really huge drops of raindrops falling. All of us were super worried that this would get heavier and we would not be able to race. Luckily the organiser decided to flag us off early by 5 mins instead of letting us get drenched by the heavy drizzle. Thankfully, it was just a passing shower. 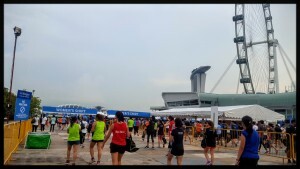 The race was flagged off by The race the Minister for Culture, Community and Youth Grace Fu and Parliamentary Secretary of the Ministry of Culture, Community and Youth Baey Yam Keng. The race was generally smooth flowing but there were some bottlenecks along the way. 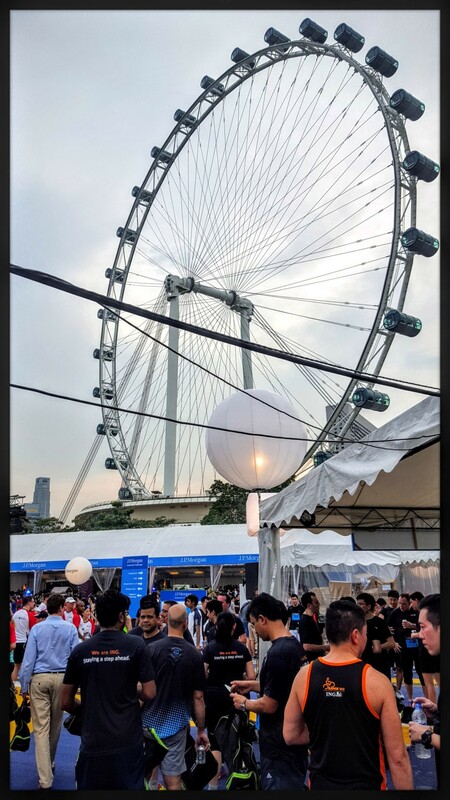 The bottlenecks areas were within the first kilometer when turning right to the Floating Platform and when going under the Double Helix Bridge en-route to the Singapore Flyer but luckily it wasn’t so bad till it jammed and come to a complete stop. The race route was mostly flat but the challenging part came at Crawford Street Tunnel which was slightly before the 4km mark. The up slope, down slop terrain will drain you of your energy but I still pushed. What I thought was good planning by the organizers was that they had placed a hydration point just after that challenging spot. That I think would be appreciated by lots of the participants after a conquering 2 slopes. I finished the race in 40 mins. Not a personal best but I’m glad I got a good workout and maintained pace throughout the race. One of the things that I like about JPMCC was that you need not wait long to get your official race timing. I received an email which was sent about 5 minutes after I crossed the Finish line that listed my average pace and Nett timing. Now that is what I call efficient. Collection of Finisher entitlements were done in a smooth and efficient manner. Every lane was well labelled and clear queues for participants to join. Bananas, a can of 100 Plus and a bottle was handed out to all participants upon completion. We were also given a Finisher Tee, a small sports bag with all the sponsor items which included vouchers from Acuvue and Watsons, Berocca sampler, Listerine mouth wash, Neutrogena SPF 50 cream and Bengay Pain Reliving Cream. All very practical products and one of the better race packs that I’ve seen this year. 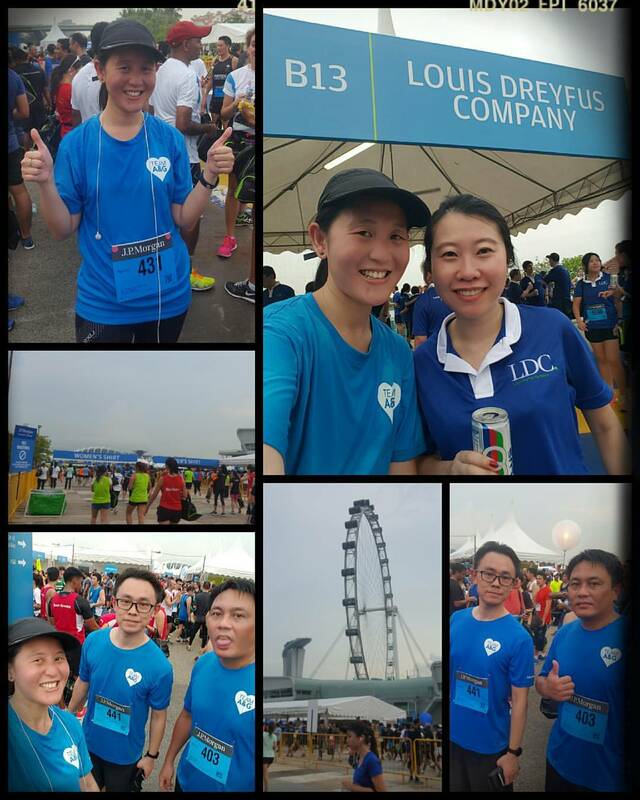 The race village always comes to live after JPMCC. There was a live band playing before the emcess came up on stage to announce the winners for the event. There were lots of stalls selling food and drinks which included ice cold beer! Who can resist?! 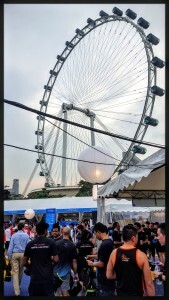 Lots of company had their own tents but for those who don’t, there were lots of sitting areas for runners to mingle and network with other participants,further encouraging camaraderie among companies and colleagues. 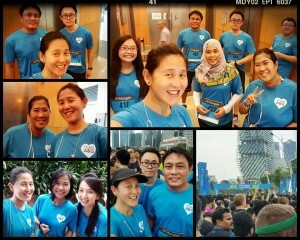 Overall, I did enjoy JPMCC. Everything was well organised and not forgetting the route took place in our very scenic CBD area. Definitely looking forward to the 2017 installment!